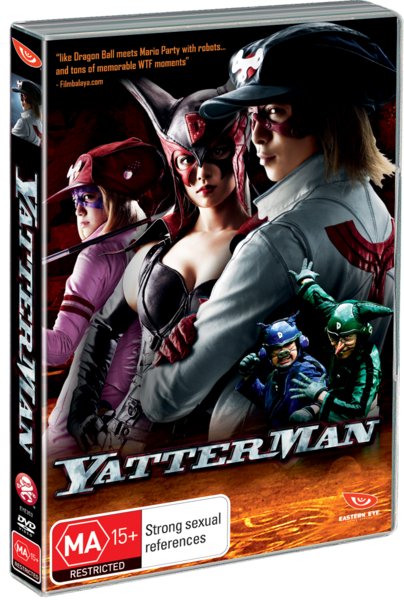 Based on the anime from the 70's, Yatterman has been brought up to date with a smooth and groovy mix of live action and CGI. Considered a bit daring even back in the 70's with sexual innuendo and off colour comments, nothing much has changed from the original recipe and from what I take from this movie, that is a good thing! Toy shop owners Gan and Ai are superheroes in disguise named Yatterman 1 & 2, fighting crime whenever evil shows it's ugly head and having a great time while they do it. With the assistance of their robot dog Yatterwoof, it's a no holds barred slug fest that is such a blaze of colour that you would be forgiven for wondering if someone had slipped director Takashi Miike some psychedelics before he got behind the camera. A change from the anime which for the purposes of the movie is welcome, is that Yatterman's nemesis, the Doronbow gang are sick of being defeated by Yatterman every time they go up against them. Lead by Lady Doronjo, the stakes are upped in order to appeal to a new audience. Director Miike has also made sure that you the audience is subjected to such a visual feast of colour and weird things to look at during the movie that I am sure that just the same as I did, will actually question if you saw what you thought you saw. Yatterman must find four pieces from a magical skull before the Doronbow do and take over the world. The feature is a delight from start to finish, and a big part of that is due to the gorgeous Kyoko Fukada who plays the role of Lady Doronjo and the sheer delight she brings to the character in being "evil". No matter what goes on in the movie, there is a feeling that prevails that no matter how badly things might appear to be going, all is going to work out in the long run. This is intentional on the part of Takashi Miike who got the inspiration from the original cartoon and it's upbeat nature despite mushroom clouds blowing up nearly every show. Video quality is nice and clear throughout this feature and is presented in 16:9 aspect ration. Audio is 5.1 surround sound with Japanese audio and English subtitles. ""I'm sure I'll end up making some more horror films in the future – just with the natural flow of things. Maybe we'll make a film like 'Ichi the Killer,' but powered up, taken to the next level."